Fuel is one of your biggest expenses and can account for up to 25 percent of your total cost of operation. You may not be able to control fuel prices, but you can maximize your heavy-duty Mack® truck's fuel efficiency through proper preventive maintenance. Fuel injectors are one of the hardest-working components of your Mack diesel engine - and vitally important to maximizing fuel economy - but over time, constant movement and intense pressure cause wear on the injectors. Worn injectors can reduce your Mack truck's fuel economy an average of 3 percent, and because all six of an engine's fuel injectors operate on the same cycle, when one fails the other five aren't far behind. When you need to replace your injectors, Mack's got your back with the REMACK® Six-Pack Injector Kit. A REMACK Injector Kit allows your engine to meter the right amount of fuel to deliver a complete combustion, thereby reducing emissions. The increased fuel economy that six new injectors deliver can add up to considerable savings - often enough to cover the cost of a Six-Pack Injector Kit in the first year alone. Mack's REMACK Injector Kits are upgraded to the latest design and engineering specs, and 100 percent inspected for optimum quality, tolerance and function by Mack-trained technicians. Critical components that control the injection event are all automatically replaced, and they're backed by a one-year, unlimited-mile warranty. 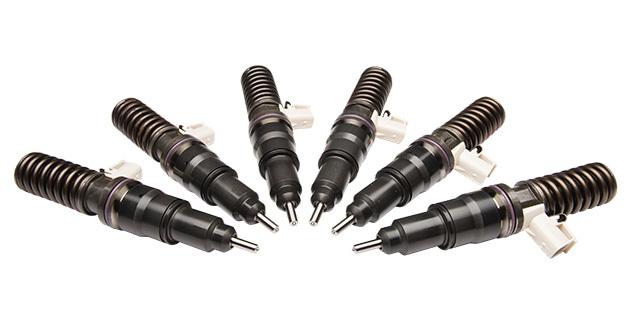 Replacing all six injectors in a single service visit will save you time and inconvenience. You'll eliminate unnecessary labor cost, downtime and the lost productivity of changing one injector at a time. When the time comes to replace your injectors, trust the folks who built your engine in the first place. See the fuel injection experts at your nearest Mack Trucks dealership.